Petition: No Temporary Deals! Keep the Government Open FOR GOOD — Without Trump's Stupid Wall! No Temporary Deals! Keep the Government Open FOR GOOD — Without Trump's Stupid Wall! Update! 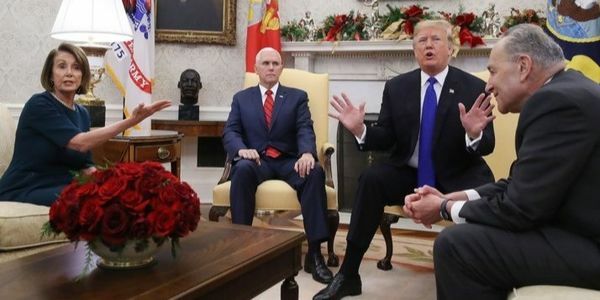 Trump and Congress just agreed to a 3-week temporary deal to re-open the government while both parties continue to negotiate Trump's $5 billion request of taxpayer money to build an unnecessary border wall. While this is great news for the over 800,000 unpaid furloughed federal workers who have not been paid since December, this is only a temporary fix. Trump has given 3-week deadline for his wall funding — or he'll do this all over again. The lives of government workers should NEVER be a bargaining chip for Trump's temper tantrum. Demand that Republicans keep the government open to ensure that all federal employees get the pay they deserve WITHOUT Trump's stupid border wall. Despite having unified control of the government, Trump and Republicans have now caused their third government shutdown in just one year. To make matters worse for the GOP, Trump had already announced that he'd take the mantle in the event of a shutdown, hamstringing his attempts to blame the Democrats. Unsurprisingly, that hasn't stopped him from doing so, but it certainly has dumped cold water on his argument. Trump is now holding the government and hundreds of thousands of federal employees hostage so he can try to get $5 billion allocated for his deeply unpopular border wall — an antiquated barrier that he promised Mexico would pay for. However, with Democrats officially taking control of the House on January 3rd, Republicans have effectively no leverage. Still, that hasn't stopped them from asking hundreds of thousands of federal employees to show up to work with no promise of a paycheck. While Trump and his cronies may claim to be populists, they clearly do not understand the plight of working Americans who rely on each and every paycheck. This shutdown is nothing more than a way to appease Trump's far-right base — but a functioning government should not be a bargaining chip for Trump's temper tantrum. We, the undersigned, demand that Republicans reopen the government and ensure that all federal employees get the pay they deserve. Republicans still control the House, the Senate, and the White House; making sure that the government remains open is the absolute least that they can do.